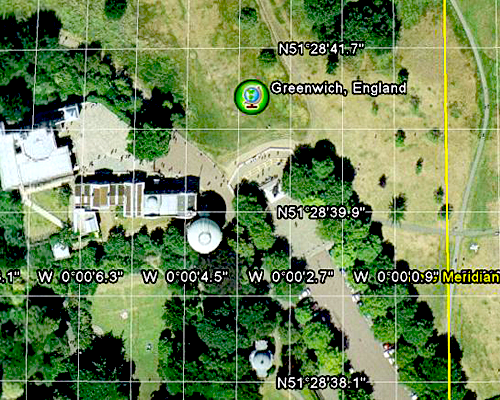 The Royal Observatory at Greenwich is on a hill in Greenwich Park in London and is the location of the Prime Meridian. The observatory was commissioned in 1675 by King Charles II for the purposes of celestial navigation and cartography. The king appointed John Flamsteed as the first Astronomer Royal to serve as the director of the new observatory. 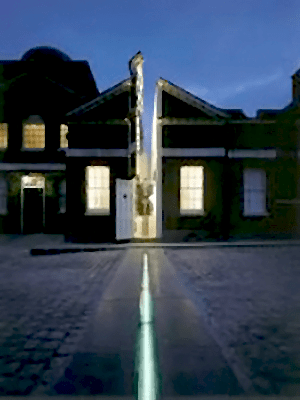 The Prime Meridian passes through the Greenwich Observatory complex and is marked by a stainless steel strip in the courtyard. In recent times, a green laser also marks the location and shines across the night sky. The Prime Meridian is part of a geographic coordinate system. This coordinate system is useful for making maps because every location on Earth can be identified by its latitude and longitude. The latitude is an angular measurement ranging from 0° at the Earth’s equator to either +90° at the north pole or −90° at the south pole. Lines of latitude are circles of differing circumferences on the Earth’s surface. The largest circle is called a great circle and it is the equator. Lines of latitude also are called parallels because the circles are parallel to each other. The equator divides the Earth into the Northern Hemisphere and the Southern Hemisphere. On the Earth’s surface, each degree of latitude corresponds to a distance of about 111 kilometers. The longitude is an angular measurement ranging from 0° at the prime meridian to either +180° eastward or −180° westward. All meridians are halves of great circles which converge at the north and south poles. The prime meridian and its opposite, the 180th meridian at 180° longitude, together form a great circle around the sphere of the Earth and divides it into the Eastern Hemisphere and the Western Hemisphere. Because lines of longitude converge at the poles, each degree of longitude corresponds to a different distance on the Earth’s surface as the latitude changes. At the equator, the distance is about 111 kilometers, but this distance gets smaller until it reaches 0 kilometers at the poles. For further precision, each degree of latitude and longitude (°) is divided into 60 minutes (‘), each of which is further divided into 60 seconds (”), e.g., San Antonio, Texas is located at 29°25′26″ N and 98° 29′ 37″ W. These coordinates also can be expressed as decimal fractions, e.g., San Antonio is 29.42412 and -98.49363. Unlike the equator, which is the one great circle perpendicular to the Earth’s axis of rotation, the location of the prime meridian is arbitrary, and can be part of any great circle that runs through both poles. Throughout history, it was common practice to choose a nation’s capital or some other popular location, so different maps had different prime meridians. Finally, it was decided in 1884 to have delegates from 25 nations meet in Washington, DC, for the International Meridian Conference. 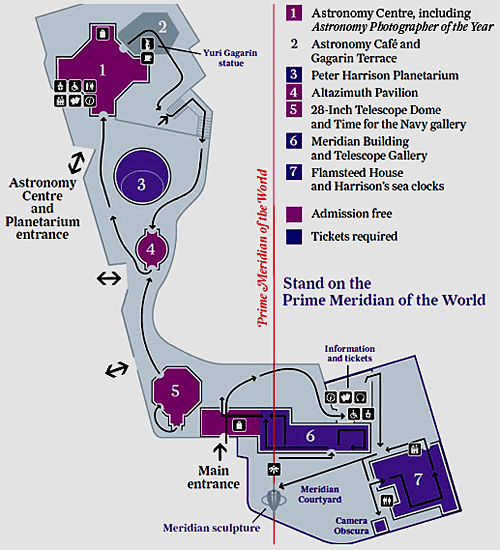 The delegates voted to adopt Greenwich as the location for the universal Prime Meridian. Once Greenwich was chosen as the universal Prime Meridian, the longitude at any location can be determined by calculating the time difference between that location and Greenwich. Since a day has 24 hours and a circle has 360°, then the sun moves across the sky at a rate of 15° per hour. As a simple example, if a location is six hours behind the time at Greenwich, then that location is near 90° west longitude. Obviously, a chronometer set to Greenwich time and the local time need to be known. So why doesn’t the Greenwich Prime Meridian show 0° longitude? The reason has to do with the fact that the Earth is not really a perfect sphere and that, until recently, most maps had to shift their lines of latitude and longitude until they matched local surface measurements to some reasonable amount. It was only until the existence of artificial satellites that maps finally could be adjusted to the center of the Earth’s mass and not to various local surfaces. The current coordinate system, the World Geodetic System, was established in 1984 (WGS 84) and measures global surface locations to within ±1 meter or better. 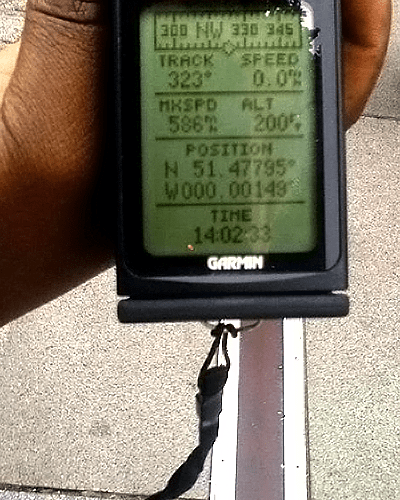 WGS 84 showed that the Greenwich Prime Meridian was actually about 5.3 seconds or about 100 meters west of 0° longitude. The new meridian is known as the International Reference Meridian and is maintained by the International Earth Rotation and Reference Systems Service (IERS). It is the reference meridian of the Global Positioning System (GPS) run by the United States Department of Defense.